The uninsured are flocking to Obamacare, but many people still find the policies pricey. 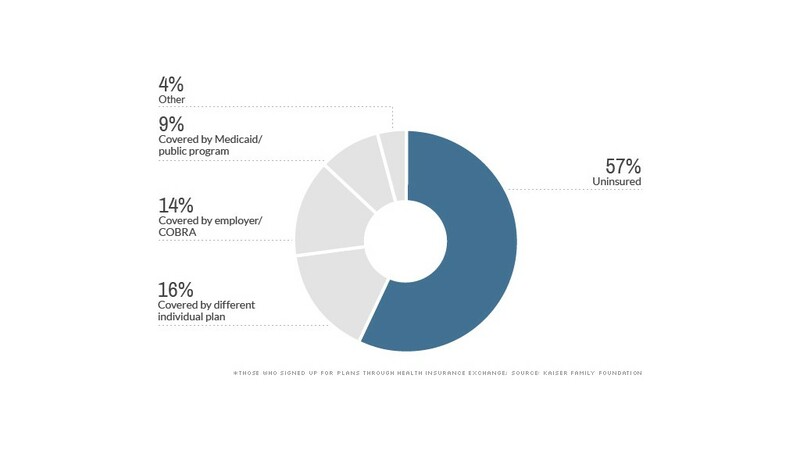 Some 57% of those who've signed up for plans on the exchanges were uninsured, according to a Kaiser Family Foundation survey released Thursday. Most people said they'd been without coverage for at least two years. The uninsured figure is far higher than other surveys have found. McKinsey & Co., for instance, reported last month that only 26% of those selecting plans were previously uninsured. Kaiser researchers attribute the difference to methodology. McKinsey, for instance, asked respondents' insurance status for most of 2013, while Kaiser focused on whether they were covered just before picking a plan. The foundation surveyed people who bought Obamacare policies through federal or state exchanges, as well as those who purchased plans that meet the Obamacare standards -- such as providing more comprehensive coverage and limiting the amount policyholders must pay out of pocket annually -- directly from insurers or agents. It also talked to those who kept their previous plans that do not comply with Obamacare. Customers are pleased with their policies, but also find coverage costly: 71% of those in Obamacare plans said their coverage was good or excellent. 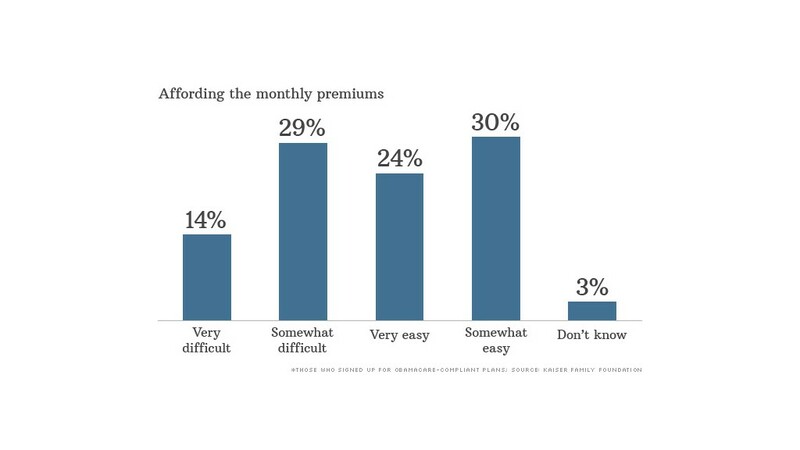 But 43% of those in Obamacare plans said it is difficult to pay the monthly premiums. Looking to the future, some 62% of those with Obamacare or non-compliant plans are worried their premiums will become unaffordable. "Affordability is still an issue," said Liz Hamel, director of public opinion and survey research at Kaiser. 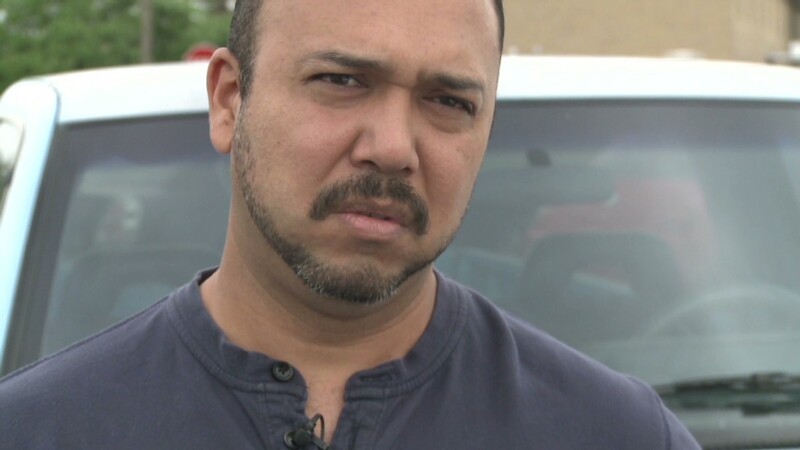 "Even though your premium may have gone down, it may still be difficult for you to afford it." Those paying less for their policies edge out those paying more: The survey also shed some light on people who previously had individual coverage but switched this year to Obamacare policies. Some 46% of these plan-switchers said they are paying less for their new policies -- likely thanks to the subsidies -- and 39% are paying more. The same number report that their deductibles are now lower and higher. But this group is less likely to be satisfied with the plans' costs and to perceive the new policies as a good value compared to its peers who were previously uninsured. Access to doctors and hospitals is an issue, but a slight majority have the same access: Just over half of the plan-switchers say they have the same access to primary care doctors, specialists and hospitals. But the remaining policyholders are much more likely to say they have less access than more. Obamacare policies have been criticized for having so-called narrow networks. Restricting access to doctors and hospitals allows insurers to keep premiums lower. When it comes to the health of those signing up for Obamacare policies, Kaiser also found that more reported they were in fair or poor condition (17%) than among those in non-compliant plans (6%). This may have an impact on premium prices in future years if insurers find themselves with sicker policyholders than expected.